I've always loved gingerbread houses. In part because of the detail involved in making them, but mostly because when I was a kid they seemed like the ultimate dessert fantasy! Each year I wanted to pick all the candy canes off the roof, but knew that I would be in big trouble if I did! So, as you can imagine, I really enjoyed seeing Red Envelope's modern take on the classic gingerbread house. It's renewed my interest in edible houses all over again! Click here for more info and to order online. Looks cool. 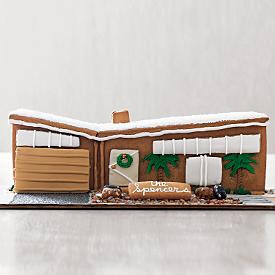 The house design looks a lot more modern than most gingerbread houses. Gee that neat! Lovin' the design! This is the simplest, yet the cutest gingerbread house I've ever seen! Cool house. We do a gingerbread house every year (with varying success), so I can appreciate the craftsmanship.